CLICK HERE to listen to episode audio (4:12). All Web addresses mentioned were functional as of 6-2-18. From the Cumberland Gap to the Atlantic Ocean, this is Virginia Water Radio for the week of June 4, 2018. GUEST VOICES - ~27 seconds – Alberto! Beryl! Chris! Debby! Ernesto! Florence! Gordon! Helene! Isaac! Joyce! Kirk! Leslie! Michael! Nadine! Oscar! Patty! Rafael! Sara! Tony! Valerie! William! If you guessed tropical storms or hurricanes, you’re right! You heard the names planned for the 2018 tropical storm season in the Atlantic basin, accompanied by “Tropical Tantrum” by Torrin Hallett. The Atlantic basin includes the Atlantic Ocean, Caribbean Sea, and Gulf of Mexico, and the Atlantic tropical storm season runs officially from June 1 through November 30. But tropical storms don’t always follow the official calendar. 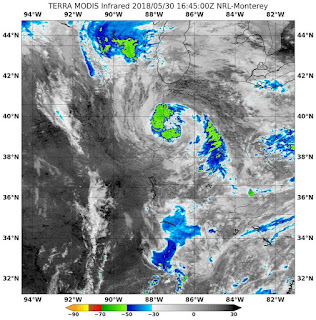 For example, this year, the Atlantic’s first named storm—Subtropical Storm Alberto—formed in late May; in 2017, Tropical Storm Arlene formed in April; and in 2016, Hurricane Alex formed in mid-January, the earliest for an Atlantic hurricane to form since 1938. Tropical storms and hurricanes are two categories of tropical cyclones—rotating storm systems that start in tropical or sub-tropical latitudes. A tropical cyclone is called a tropical storm—and gets a name—when sustained wind speeds reach 39 miles per hour; at 74 miles per hour, a tropical cyclone is considered a hurricane. Tropical depressions—with wind speeds below 39 miles per hour—don’t get names, but they can still bring heavy rainfall and flooding. Before a tropical system of any speed or name barges into the Old Dominion...[SOUND - ~6 sec – wind, rain, thunder]...you can get ready by making a written emergency plan, including an evacuation plan; assembling an emergency kit of food, water, and supplies; preparing your home for high winds; and establishing ways to stay informed, especially if the power goes out. Detailed safety tips for tropical storms and other severe weather are available from the “Safety” link at the National Weather Service Web site, www.weather.gov. While Hurricane Preparedness Week for 2018 was May 6-12, right now is still a good time to start getting ready for the next tropical storm! Thanks to 14 Virginia Tech faculty, staff, and students for lending their voices to this episode, and thanks to Torrin Hallett for this week’s music. “Tropical Tantrum” is copyright 2017 by Torrin Hallett, used with permission. More information about Torrin is available at his Web site, http://www.torrinjhallett.com/. Thanks very much to Torrin for composing the piece especially for Virginia Water Radio. 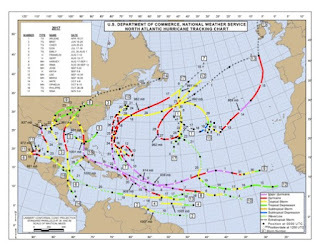 Names and tracks of Atlantic tropical storms in 2017, according to the National Hurricane Center, online at https://www.nhc.noaa.gov/data/tcr/index.php?season=2017&basin=atl. The following information is quoted from the National Weather Service’s “Hurricane Preparedness Week 2018” list of tips for each day of a week, online at http://www.weather.gov/wrn/hurricane-preparedness#prepweek. Find out today what types of wind and water hazards could happen where you live, and then start preparing now for how to handle them. Hurricanes are not just a coastal problem. Their impacts can be felt hundreds of miles inland. It’s easy to forget what a hurricane is capable of doing. You’re going to need supplies not just to get through the storm but for the potentially lengthy and unpleasant aftermath. Have enough non-perishable food, water and medicine to last each person in your family a minimum of one week. Electricity and water could be out for at least that long. You’ll need extra cash, a battery-powered radio and flashlights. Many of us have cell phones, and they all run on batteries. You’re going to need a portable, crank, or solar-powered USB charger. National Hurricane Center (NHC), main Web page, online at http://www.nhc.noaa.gov/. This site provides bulletins, maps, and other information on tropical storms as they are occurring. NHC, “Glossary,” online at https://www.nhc.noaa.gov/aboutgloss.shtml?. This site includes the wind-scale designations for tropical depression, tropical storm, and hurricane. NHC, “Hurricane Preparedness Week,” online at http://www.weather.gov/wrn/hurricane-preparedness. 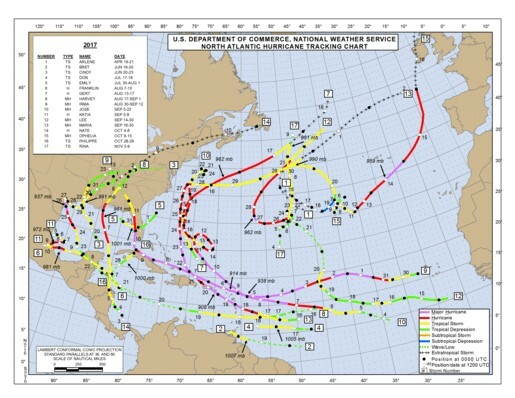 NHC, “NHC Data Archive,” online at http://www.nhc.noaa.gov/data/. NHC, “Saffir-Simpson Hurricane Wind Scale,” online at https://www.nhc.noaa.gov/aboutsshws.php. 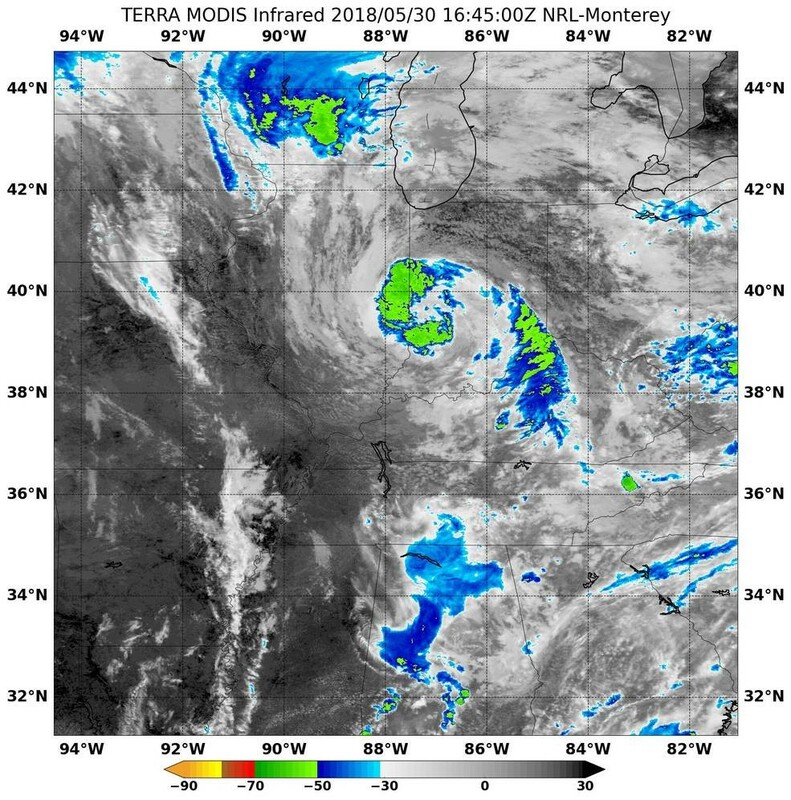 NHC, “Subtropical Storm Alberto,” online at https://www.nhc.noaa.gov/archive/2018/ALBERTO.shtml?. National Oceanic and Atmospheric Administration (NOAA), “What’s the difference between a hurricane and a typhoon?” online at https://oceanservice.noaa.gov/facts/cyclone.html. This site discusses tropical cyclones. NOAA, "Forecasters predict a near- or above-normal 2018 Atlantic hurricane season," May 24, 2018, online at http://www.noaa.gov/media-release/forecasters-predict-near-or-above-normal-2018-atlantic-hurricane-season. NOAA, “Tropical Cyclone Names,” online at http://www.nhc.noaa.gov/aboutnames.shtml. Episode 385, 9/11/17 - Hurricane Irma and storm surge.